Do I need a Crown? Do I need a Cap? * Metals used in crowns include gold alloy, other alloys (for example, palladium) or a base-metal alloy (for example, nickel or chromium). Compared with other crown types, less tooth structure needs to be removed with metal crowns, and tooth wear to opposing teeth is kept to a minimum. Metal crowns withstand biting and chewing forces well and probably last the longest in terms of wear down. Also, metal crowns rarely chip or break. The metallic color is the main drawback. Metal crowns are a good choice for out-of-sight molars. * Porcelain-fused-to-metal dental crowns can be color matched to your adjacent teeth (unlike the metallic crowns). However, more wearing to the opposing teeth occurs with this crown type compared with metal or resin crowns. The crown"s porcelain portion can also chip or break off. Next to all-ceramic crowns, porcelain-fused-to-metal crowns look most like normal teeth. However, sometimes the metal underlying the crown"s porcelain can show through as a dark line, especially at the gum line and even more so if your gums recede. These crowns can be a good choice for front or back teeth. * All-resin dental crowns are less expensive than other crown types. However, they wear down over time and are more prone to fractures than porcelain-fused-to-metal crowns. * All-ceramic or all-porcelain dental crowns provide the best natural color match than any other crown type and may be more suitable for people with metal allergies. However, they are not as strong as porcelain-fused-to-metal crowns and they wear down opposing teeth a little more than metal or resin crowns. All-ceramic crowns are a good choice for front teeth. * Temporary versus permanent. Temporary crowns can be made in our office whereas permanent crowns are made in a dental laboratory. 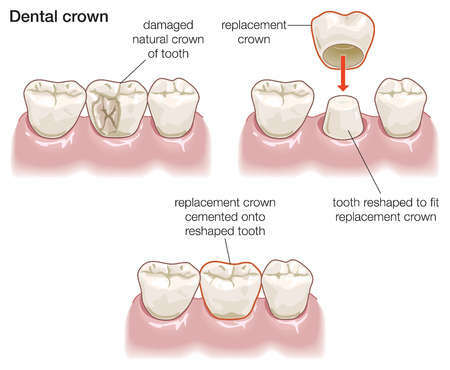 Temporary crowns are made of acrylic or stainless steel and can be used as a temporary restoration until a permanent crown is constructed by the dental laboratory. Dr. James Courey is a New Jersey Top Dentist, Prosthodontics, and is proud to care for patients from in Manalapan, Freehold, Marlboro, Old Bridge, North Brunswick, Red Bank, Monroe, Howell, Long Branch, Deal, Princeton, Parsippany, Short Hills, Livingston, Robbinsville, Colts Neck, Spring Lake, Millstone, Naples FL, State Island NY, Philadelphia PA, Manhattan and across the country.